Because cherry season is short and I adore them, I feel an intense obligation to figure out how to make the most of them when they're at that fabulous sweet/tart height of harvest. And that would be now. I could eat them endlessly as a snack but I got to thinking about how well they go with savory foods like pork and poultry. Four years ago I made a salsa from stone fruit that included cherries, along with peaches. But I got to wondering how a salsa that really focused on cherries would work. I had just bought about a pound of cherries and decided to put together a salsa that didn't rely on some lovely balsamic vinegar, but traditional lime juice. Not basil, but cilantro. 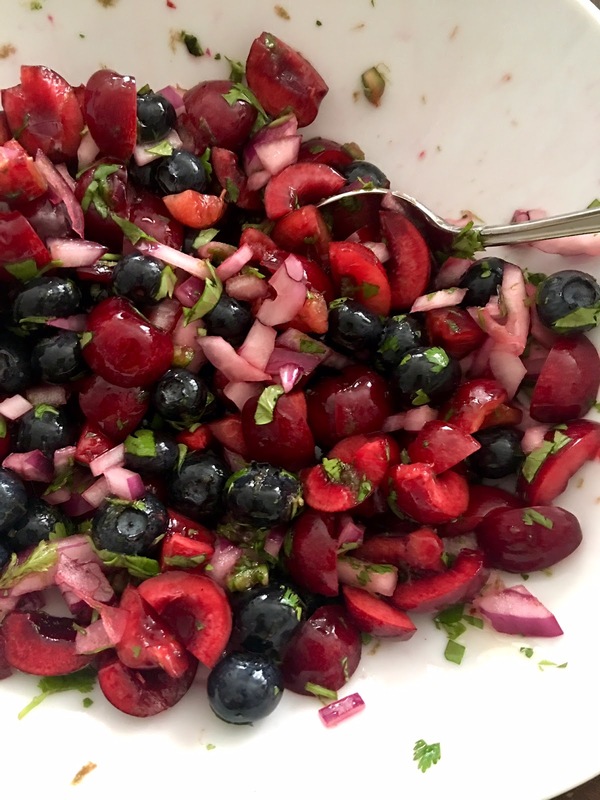 Since I also had a large container of blueberries I thought they'd add both an intriguing texture and flavor--not to mention stunning color--to the salsa. In came red onion, the one and only serrano chile in my garden, and the lime's zest. I didn't think garlic would be a happy combination so I left it out. I tasted the mixture and it was fine but lacking something, so in went honey--not much, but enough to heighten the sweetness. Another taste and something was still needed. Then I hit on it. Tajin seasoning! I had considered then discarded the idea of adding salt but the Tajin added just enough to bring out the other flavors, just a bit more acid/tartness from lime, and a different kind of heat. It proved to be exactly the right finish to create three-dimensional flavor. While the salsa stewed in its juices in the fridge, I pulled out a pair of pork chops I had been brining since late morning. Despite the heat of the early evening, I put a cast-iron pan in the oven and let both pre-heat until the temperature reached 400˚. I pulled out the seasoned, lightly oiled chops (adding more Tajin) and pan seared them (be sure to use oven mitts while handling the pan. I love this technique because you put the chops on the pan and immediately they sizzle and start browning. Once they were golden brown, I placed them in the pan into that still 400˚ oven to cook until they reached an internal temp of 145˚. While they rested on a plate under a foil tent, I tasted the salsa again. It was delightful. 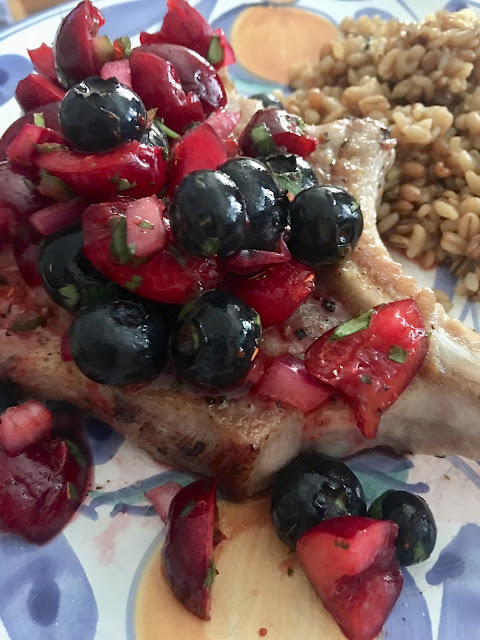 The pork chop was a success--made summery with my cherry berry salsa. Don't love blueberries? Add raspberries or strawberries--or both! 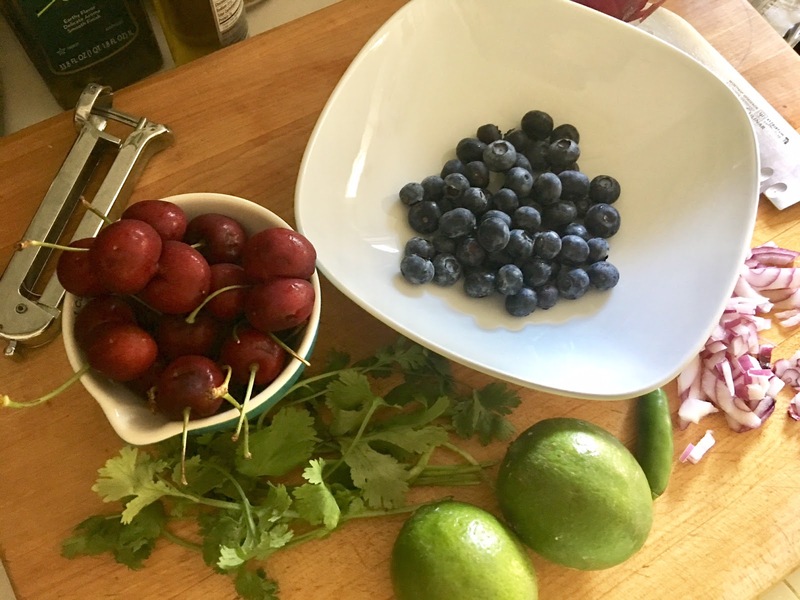 You'll have a colorful sweet and savory fresh sauce that will be equally terrific on a pulled pork taco, on a quesadilla, roasted chicken or duck, or a pork tenderloin. 1. Pit the cherries, then quarter them. Set aside. 2. Zest the lime, then cut in half and juice both halves. 3. Combine all the ingredients in a bowl. Mix well and let sit in the refrigerator at least one hour. Taste and adjust seasonings. Are you a frustrated pizza maker? I think all of us who love to cook have gone through a pizza-making phase, finally giving it up in frustration. We've lined ovens with tiles, spritzed with water, tried different flours, different methods of dough making. And then threw up our hands and went out to eat. I think you should give it one more shot--based on an afternoon I spent with Andrea Burrone of Ambrogio15 in Pacific Beach. This sweet, charming, and very talented young man from Milan, who started out professionally working in banking, has clearly found his calling. And his calling is making pizza in San Diego using traditional Italian ingredients and techniques... Lucky us. Now Burrone is working with something we don't have: a ginormous Marana Forni oven imported from Italy that reaches temperatures of 700 degrees--something your home oven can't even dream of. But are there any home cooks better than Italian home cooks? If they can do it in their ovens, so can we--if we know what we're doing. And with Burrone as a coach, we now know what we're doing. The other thing we should do is to bake the crust first, then add the topping. This way the pizza crust gets nice and crunchy, not soggy (yeah, I've been there, too). And the dough should be baked first at the bottom of the oven sans toppings and then in the middle once it's filled. Instead of making dough in his large mixer, Burrone demonstrated dough making in a Kitchen Aid stand mixer, using the dough hook. First, he began by activating the yeast, mixing it with room temperature water and sugar, then letting it sit for about 15 minutes. Once the yeast was bubbling, he placed 0 flour in the bowl of the mixer. He then added the yeast mixture, slowly blending it until incorporated. With that, Burrone added more water and brought up the speed, then olive oil, speeding it up again, then salt. Max out the speed and keep it going until the dough pulls away from the sides and forms a ball. Depending on the weather--both temperature and humidity--you may have to add more flour or more oil to get it to that point. Stop the mixer, pull the bowl out, cover and let the dough rest until it doubles in size. Then comes the fun. Divide the dough into sections 100 grams each (yeah, you'll need a kitchen scale to do all this). Each ball will make a 12-inch round paper thin Milano-style pizza. Turn each piece into a ball by pulling the sides out and under until the ball is smooth. Then turn it over and pinch the underside to seal. Do this to each piece, cover, and let rest at least two hours until they've doubled in volume. When you're ready to make the pizzas, turn on the oven to 500˚F to preheat. Now you have a choice--you can either use a rolling pin to roll out the dough or use the tips of your fingers to gently press it out. Use flour or semolina to keep the surface from getting sticky when you shape the dough. And when you put the shaped dough on a pan, be sure to put oil topped by a sprinkling of semolina or cooking spray on the pan before placing the dough on it. Now you'll place the pan in the lowest part of the oven for 12 to 15 minutes. Remove it and add your topping--whether it's the delightful Arugula Pistachio Pesto below or tomato sauce (be sure to use peeled San Marzano tomatoes with basil--in the yellow can--for what Burrone says is the most authentic margherita-style pizza), topped with cheese. Then put the pizza back in the oven, but on a rack in the middle of the oven. Bake it for another 4 to 5 minutes until the cheese is melted. That's it! Here's another Burrone tip. If you're using fresh mozzarella on your pizza, make sure that the night before you place it in a colander over a bowl so that it will release its water--and you again avoid a soggy pizza crust. And don't, don't, don't use pre-shredded cheese. Just don't. Pleased with yourself and ready for dessert? Burrone's co-owner Giacomo Pizzigoni shared a "grandma" recipe with me. A chocolate salami. This, he says, is very common in Italy but not something you'll ever find in restaurants (including Ambrogio15). Make it now, taking advantage of the fact that it requires no cooking, or making it when it's most traditional--at Christmas time. The "salami" is, in fact, cocoa powder mixed with sugar, biscuit pieces, melted butter, and very fresh eggs, all mixed together, shaped into a sausage, wrapped in foil, and frozen for an hour. Pizzigoni said to serve it with whipped cream, mascarpone, or berries. I can tell you it's fabulous! Note: Most American home cooks are used to measuring by volume, not weight. Here, most of the amounts are indicated by weight using grams. If you have a kitchen scale, this should be no problem--and the measurements will be more accurate, creating a more successful outcome. 1. Combine yeast, water, and sugar. Let sit 15 minutes. It should be bubbling. 2. Insert dough hook in stand mixer. Place flour in the mixer's bowl. Add yeast mixer and start blending at the 3 speed until incorporated. Slowly add water and bring up speed to blend. Slow it down and add the olive oil and speed it up again. Slow it down to add salt (and, if it's too thin, more flour). Bring the mixer to maximum speed (6 to 8) and mix until the dough pulls away from the sides and forms a ball. 3. Remove bowl from mixer, cover, and let the dough rest for 30 minutes until doubled in size. 4. Divide the dough into 5 to 6 pieces, each weighing 100 grams for a 12-inch pizza. Form balls with each by pulling the sides out and under while turning until the surface is smooth. Pinch the underside to seal. Sprinkle some semolina or flour on the counter or a tray and place the balls on them. Cover and let rest for at least 2 hours until the balls double in volume. 5. To make the pest, place all the ingredients except the oil in the bowl of a food processor or blender. Blend them together, then slowly add the oil. If it's too thick, add a little water. Taste and adjust seasonings. Set aside. 6. To cook the pizza, preheat the oven to 500˚F. Roll out the dough by hand, pressing and shaping it in a 12-inch circle with your fingertips, or use a rolling pin. Spread a little oil on the pan and then sprinkle it lightly with semolina or use a baking spray like Pam. Place the pizza dough on the pan and place on the lowest rack in the oven. Bake for 12 to 15 minutes. 7. Remove pizza crust from oven. Spread about 2 tablespoons of pesto on the crust and top with pieces of mozzarella. 8. Place pizza back in the oven, but on the middle rack. Bake another 4 to 5 minutes. Remove and top with folded slices of mortadella and fresh cherry tomatoes. 1. Combine the biscuits, sugar, cocoa, and eggs. Mix well. Add butter and mix well. 2. Pour the mixture on a large piece of aluminum foil--about 2 feet long. Shape into a salami. 3. Wrap the foil around the salami and freeze for 1 hour. Place in refrigerator. 4. To serve, slice pieces and plate. Serve with berries and mascarpone or whipped cream. 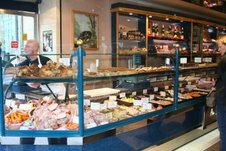 Ambrogio15 is open Monday through Thursday from 4:30 to 10 p.m. and until 11 p.m. on Fridays. On Saturday, it's open from noon to 11 p.m. and on Sunday, noon to 10 p.m. 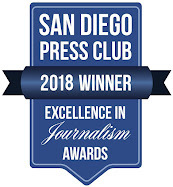 It's located at 926 Turquoise St. in North Pacific Beach. It started with a peach. 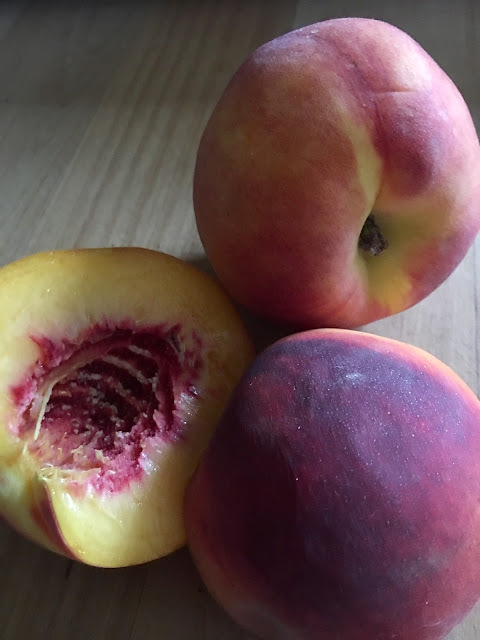 A perfectly ripe, fragrant peach that I was about to bite into, anticipating the juices running down my chin. Actually, no. Let me start over. It started with a hot and humid afternoon--so humid that there was a freak five-minute downpour in my neighborhood, with thick raindrops striking the pavement and surprising neighbors outside my window walking their dogs and babies. There was no way I could cook anything for dinner. So as I lifted that rosy peach to my mouth I thought the better of it, set it down on the counter, and contemplated what I could do to turn it into the star of a cold meal. Slicing it into a salad of greens would be easy, but--eh. I wanted it to be the salad--a composed salad. I pulled out an English cucumber. Not a natural peach partner, but why not? Nothing says chill like a cucumber. It got thinly sliced and laid out onto a rectangular plate. 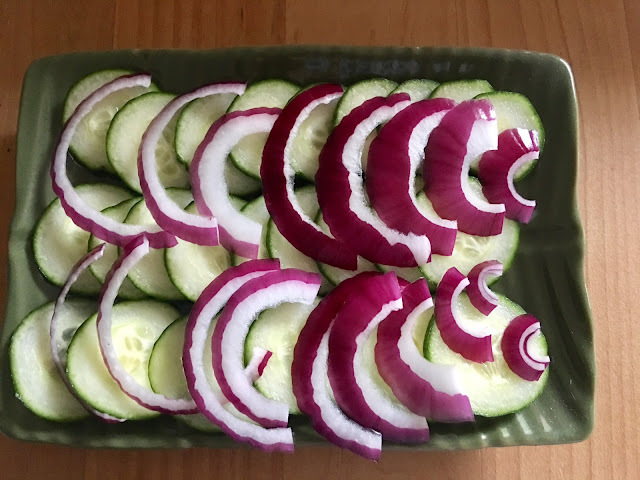 I sliced a red onion and placed those on top. Then came slices of peaches. 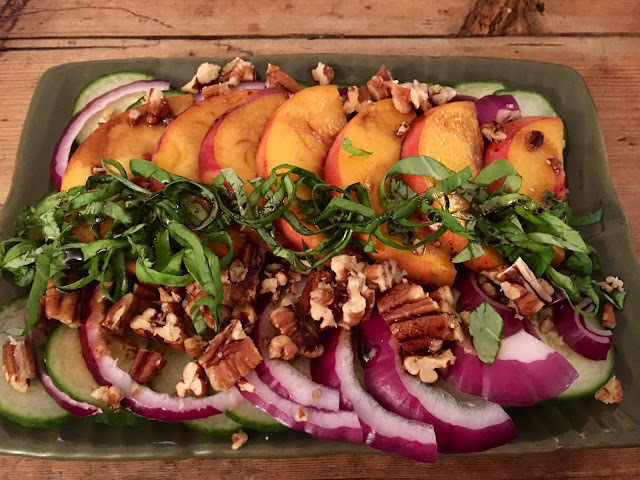 Now, on a different day with different weather, I would have grilled the peach--but that was not the point of this particular meal. Next up were pecans. 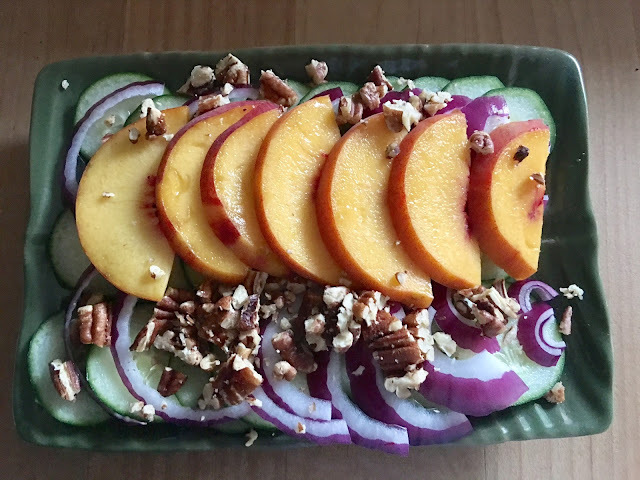 Pecans are lovely paired with peaches and Trader Joe's sells these marvelous roasted and salted bags I keep in the freezer. I pulled that out and shook out about a quarter cup, which I then roughly chopped. I have basil growing on my kitchen windowsill so I cut off a half dozen large leaves and did a chiffonade on them. That was it. If I had had a ball of fresh mozzarella or burrata I would have added slices of cheese. Next was how to dress the salad. 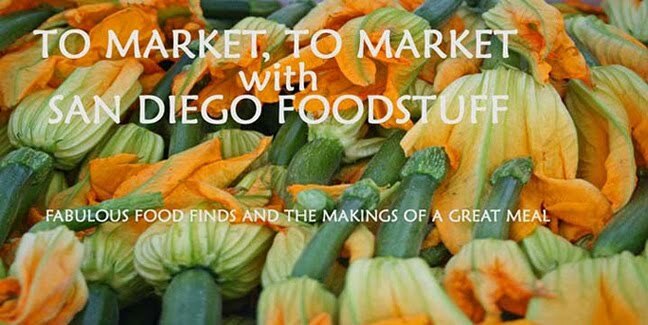 I combed through my pantry and pulled out a bottle of thick, sweet violet balsamic vinegar from Baker & Olive and my favorite McEvoy olive oil. I mixed up a couple of tablespoons and drizzled the mixture over the salad before digging in. Simple, easy, no sweat--and delicious. 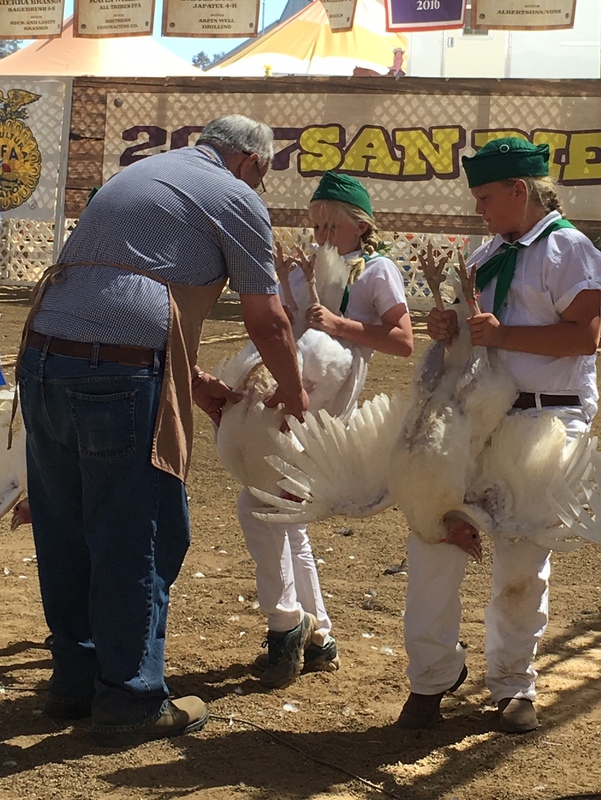 You may think of the San Diego County Fair as the place to get your deep-fried pickles, but for hundreds of kids involved in 4-H and Future Farmers of America, this is show time. Quite literally. You have to tour the big halls filled with cows and pigs, turkeys and rabbits, and, of course, chickens. Among those who regularly exhibit their animals are the Konyn children--Kylie, Kiara, and Teo. The two sisters and their brother have grown up on the family dairy in North County. Kylie, the eldest, is now a teenager, but she's been raising dairy heifers, horses, and poultry since she was five or six. 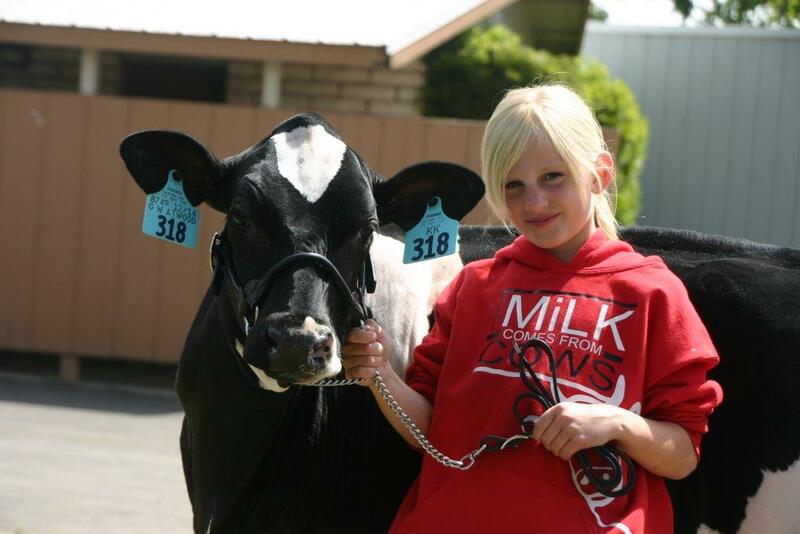 And she's been winning awards since she first joined 4-H--both at the San Diego County Fair and the Ramona Fair. As she told me a couple of years ago, "It definitely got me hooked." With the fair over, the animals she and her siblings have raised and exhibited are now being harvested and readied for sale. Kylie, again, received Supreme Champion Exhibitor as well as Supreme Champion Cow and Bull during the breeding show and both girls won Showmanship. Teo won Grand Champion with his meat rabbits. Mom Stacy Konyn let me know they will be harvesting all the meat birds and turkeys they raised this coming Friday (July 7). If you're interested in farm fresh chickens or turkeys, these should be delicious. Stacy says that they sell the meat birds harvested and ready for the oven or freezer for $5 a pound, with the average price of chickens about $30 to $35. Farm-raised, free-range turkeys at weights from 22 to 30 pounds will cost from $125 to $165. Teo has four rabbits available now and will have 15 rabbits for sale at the beginning of August. They'll cost between $25 to $30. Also available, says Stacy, are three market goats that are being harvested. Contact Stacy Konyn at nzbound@sbcglobal.net if you're interested in making a purchase.